Even a quick Google search will show that there is a myriad of reactions from people when they think about spiral staircases, from total drooling adoration to concerns about children tripping up – or falling down! However, if you read many of the responses on the various blog posts you’ll probably end up completely confused at best and downright scared at worst! Let’s help to clear up the concerns for you. Myth Number 1 Spiral staircases are too steep for children to use safely? In a word “no”, so long as the staircase has complied with the UK Building Regulations – and this applies to all staircases, not just spirals. For a spiral staircase, the key measurement is the distance between each tread – called the tread rise, and this should be between 150mm and 220mm for a staircase in a home. In practice, most stairs have a tread rise between 190mm and 220mm, which is a comfortable tread rise for most people and children. 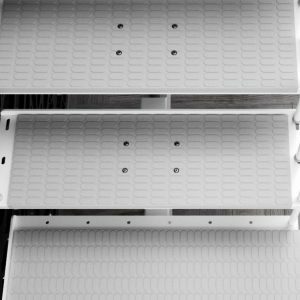 Many of the staircases on our website are manufactured in Italy and their regulations allow a tread rise of up to 235mm but you can chose to keep within the UK regulations when you install them in the UK. Myth Number 2 So steepness shouldn’t be a problem on a spiral, but what about a modular staircase? 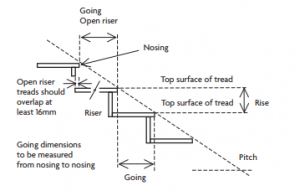 The same tread rise regulation applies to modular staircases but this is combined with another measurement called the ‘tread going’. The is the depth of the flat part of the tread, where you place your foot, and this should be between 220mm and 300mm. 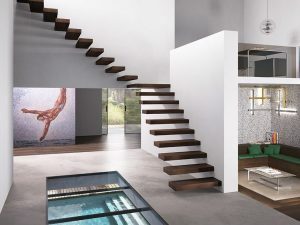 These two dimensions will create the steepness (or ‘pitch’) of a modular staircase, and the Building Regulations stipulate that it should be less than 42 degrees. 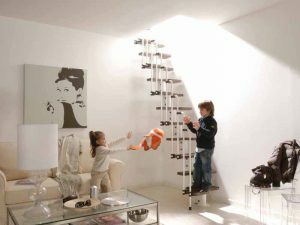 An ideal set of measurements for a modular staircase would be a tread rise of 215mm combined with a tread going of 220mm, to create a staircase which is comfortable for all members of the family. The exception to this 42 degrees pitch is the design of a spacesaver staircase. This is a special staircase which has half of each tread cut away so that you use alternate sides of the tread as you go up or down the staircase – hence the name of ‘Alternate Staircase’. Each full side of the tread should still have a tread going of 220mm but the alternate tread format allows the staircase treads to ‘concertina’ up and shrink the overall space that the staircase takes up. So, even though the tread rise should still be below 220mm, the format of the treads does create a steeper staircase, usually about 63 degrees. 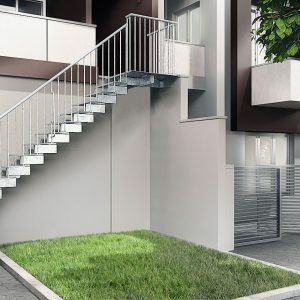 Spacesaver stairs should only be used to access loft rooms, where a regular staircase can’t be used and it’s usually best to get the approval of your local Building Control Department if you’re planning to install one. 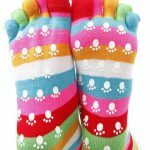 Children can use these safely but may need to be helped to understand the shape of the treads first, so that they can use them confidently. Myth Number 3 Aren’t children worried about open treads on a staircase? If you’ve followed the Building Regulations, then the answer is “no”. 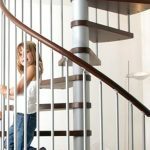 The Regs say that there should be no gap, either between open treads, or between the spindles on the staircase balustrading that is more than 100mm and this is to prevent any risk of children under 5 years old getting their heads stuck. So, for all of our staircases, we offer a ‘Riserbar Kit’ which provides a bar which fits horizontally between each tread and cuts the open gap in half so that it’s safe. The rest of Europe has slightly different measurements for their open gaps and many of our staircases here have gaps between the baluster spindles which are slightly over 100mm because they fully comply with the regulations in the country of their manufacturer. We always try to advise if this is the case in the details on the product pages so that you can make an informed decision. Myth Number 4 The timber treads are always slippery. 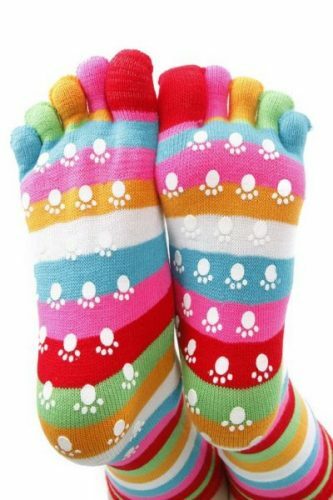 Well, the treads are sealed not polished and they do retain some of their surface texture but, as with any wooden surface, care should be taken when you walk on it, especially if only socks are worn. Common sense comes into play here, really. Myth Number 5 My home is my castle so why can’t I have a staircase like those in TV programmes which have open treads or sometimes there’s no handrail or balustrading? Er… This is a question that we actually can’t answer for you! Sometimes, people take no notice of the Building Regulations or argue that their specific project has a certain design integrity which would be compromised if they strictly adhere to the regulations.